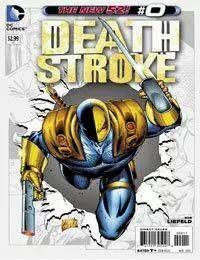 Deathstroke is the worlds greatest assassin/mercenary and an enemy of the Teen Titans. Originally a soldier in the U.S. Army, he was part of an experimental super-soldier project where he gained enhanced strength, agility and intelligence. His vendetta against the Titans began when he swore revenge for the death of his oldest son Grant; his other two children would go on to become Titans members as Jericho and Ravager. Traditionally his actions have been limited by a strong personal code of honor, although his motives became more villainous following the death of his wife Adeline Kane. Through this time his only steady companion is his loyal manservant Major Wintergreen. He has been a member of Checkmate, H.I.V.E., the Injustice League, the Secret Society of Super-Villains, the Titans and Titans East.